Feel positively glamorous with this women's Marianella denim jacket from Sofía Jeans by Sofía Vergara, exclusively at Walmart.com. Made of super-soft and stretchy denim, it'll keep you moving freely from getting your morning coffee to dancing at night. 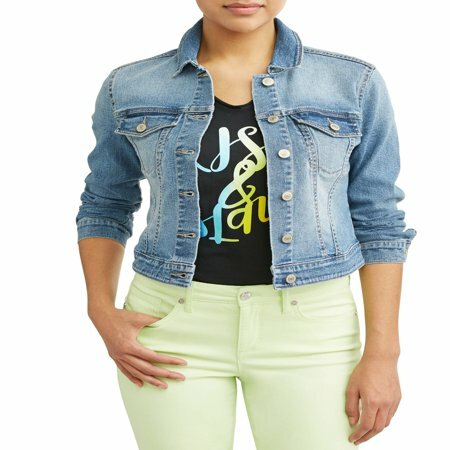 Siéntete positivamente glamorosa con esta chaqueta de mezclilla Marianella para mujer de Sofía Jeans por Sofía Vergara, exclusivamente en Walmart.com. Hecho de mezclilla súper suave y elástica, te ayudará a moverte libremente de tu café de la manana a bailar por la noche. Get an evil eye bracelet with your purchase. While supplies last.Obtén un brazalete para el “mal de ojo” con tu compra. Hasta agotar existencias. I got the xxl and it fits beautifully! Even through it's an xxl this is the only jacket I have ever put on where the arms fit and it is tailored nicely giving you an hourglass shape! It's also the perfect length and color! Also has the perfect amount of stretch and is very comfortable. Love it! Soft, high quality denim. Has a great fitted shape. Ran a little large so had to get one size smaller. Overall a really nice item.